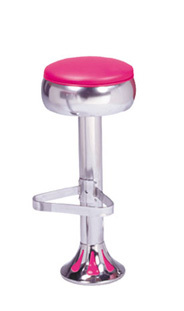 The Model B6T2 counter stool features a bulged ring swivel seat, chrome column, and tear drop base. Tear Drop colors come in 7 powder coated selections. Optional foot rests. Installation hardware and wrench included. Available in your choice of standard and designer vinyls.